Prisoners have used their newly acquired carpentry skills to help boost London's declining sparrow population. Ten bird boxes built by inmates at Spring Hill prison in Buckinghamshire will be installed at London Zoo, where a colony of sparrows has set up home. 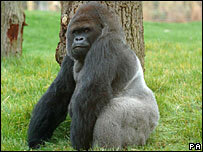 The birds have been living alongside three western lowland gorillas in the newly opened Gorilla Kingdom exhibit. It is hoped the nest boxes will encourage the birds to breed and stay in the area. In the last decade sparrows have significantly declined in London and have all but disappeared from some parks. Staff at the zoo in Regent's Park organised the joint scheme when they realised the birds would soon begin looking for their spring homes. 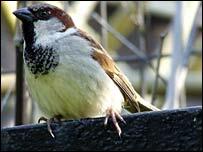 Spokesman Jonathan Baillie said: "Sparrows used to be a common sight in London, earning their reputation as the 'cockney sparra'. "Unfortunately this is no longer the case and these delightful birds need help to prevent their British population declining further. "The new boxes in Gorilla Kingdom will encourage the colony to breed and remain here." According to the zoo, Guy, a gorilla who lived at the zoo for more than 30 years from 1947, was famous for picking up sparrows and inspecting them before gently setting them down again.